As part of the NL-ARG cooperation and exchange, a stakeholder workshop was organized in August 2018 to discuss the possibilities for the future of the Parana Delta­­­­ – an important yet fragile natural water system located between the provinces of Buenos Aires, Entre Ríos and Santa Fe. 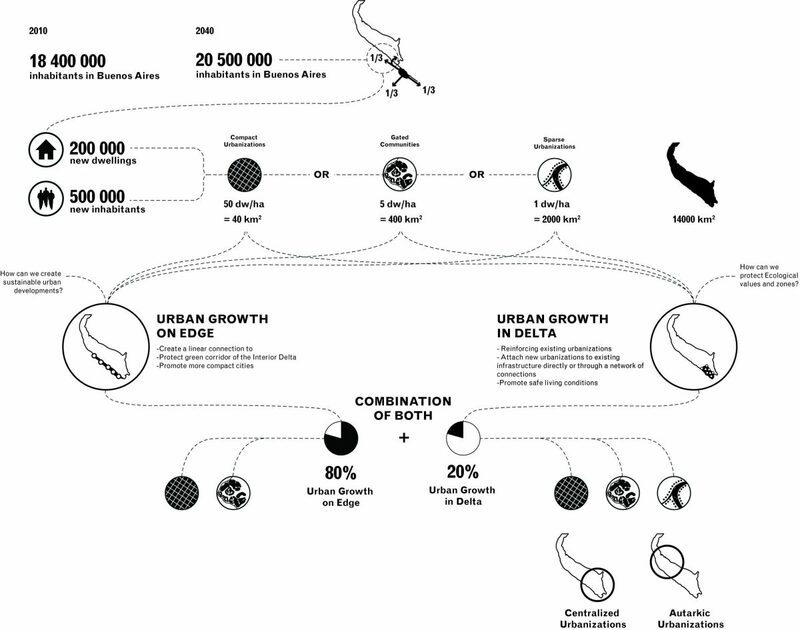 Based on the results of this workshop, three Dutch design offices, in collaboration with Deltares and INA, explored in a research by design process a sustainable development perspective for the Parana Delta. The research and results were presented at the end of October at the Conferencia Binacional de gestion Integral del Agua in Buenos Aires. The work presented is meant to generate further discussion, while also acting as a plea for an integrated approach to address the complex pressures from climate change, infrastructure, ecology, economic productivity and urbanization in the delta. The areas surrounding the Parana Delta continue to rapidly urbanize, and the recreational and urban continental edge of the lower delta is increasingly developing into the floodplain. The interior of the delta sees much intensification of land use for economic production that modifies the landscape through unsustainable methods such as poldering, putting the delta at further risk. The research conducted pointed towards creating perspectives that promote a balance between all the aforementioned pressures in order to ensure there was room for water to flow through the Delta. In order to explore this balance, we developed some strategies to frame the safe and sustainable future of the delta. An ambition for the delta is to create sustainable ways to inhabit, cultivate and preserve the interior areas. 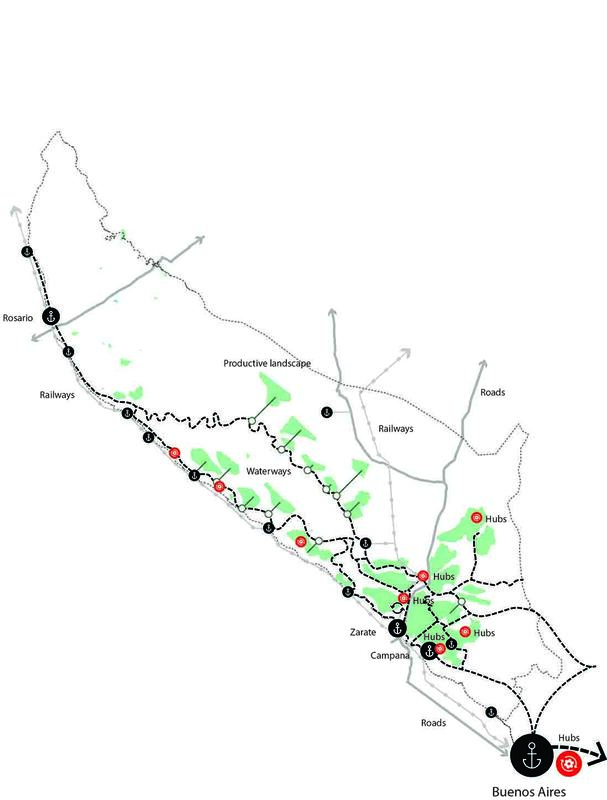 One uses sustainable poldering to create connected and autarkic activities for living, production and ecology. 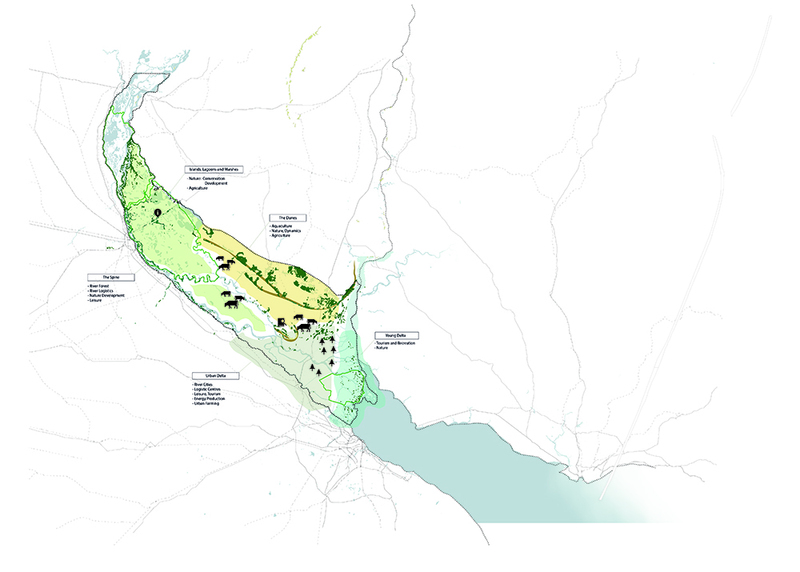 It also creates a more sustainable edge along the Delta, promoting the balance between urban and nature, while taking into account current and future needs for infrastructure. 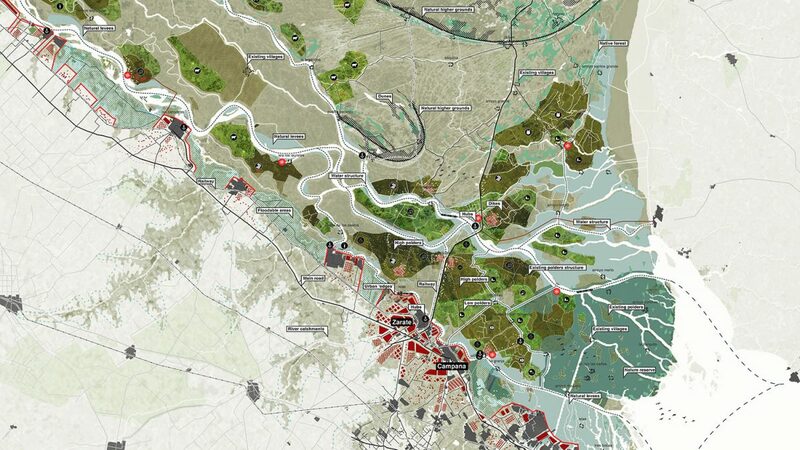 There are many visions for the delta, as the delta has the potential to be a national park, to strengthen its existing infrastructure and foster logistical hubs, to be a green boulevard that converses yet is protected from the surrounding urbanisms, and to be a renewable energy producer. All of these envision a future delta that is sustainable, productive and a source of national pride. Urban growth in the area: The populations of the provinces surrounding the Delta are growing at a very intense rate. In order to create a sustainable urban development, a response is needed to the population demand. 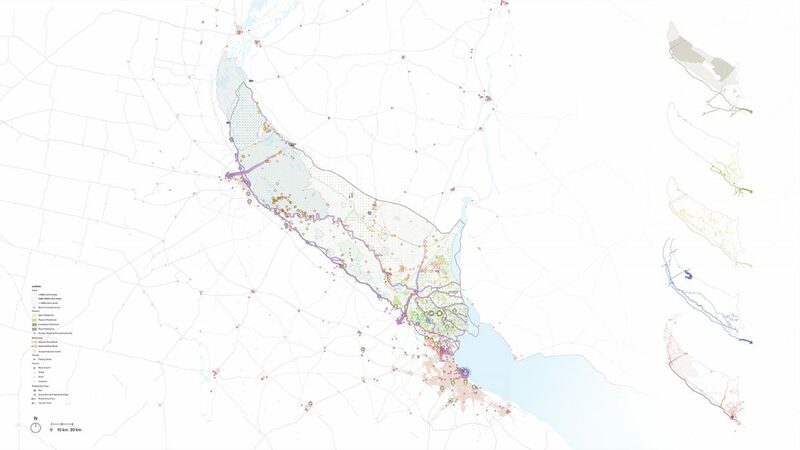 The strategy: This strategy shows how sustainable polders can be used for living, production and ecology, and can be connected to existing infrastructure within the delta. The intensity and type of intervention is determined by safety and flood risks, in addition to the location of the activity in the delta. Other Visions for the Delta: National Park- uniting ecological reserves, promoting research and eco tourism. 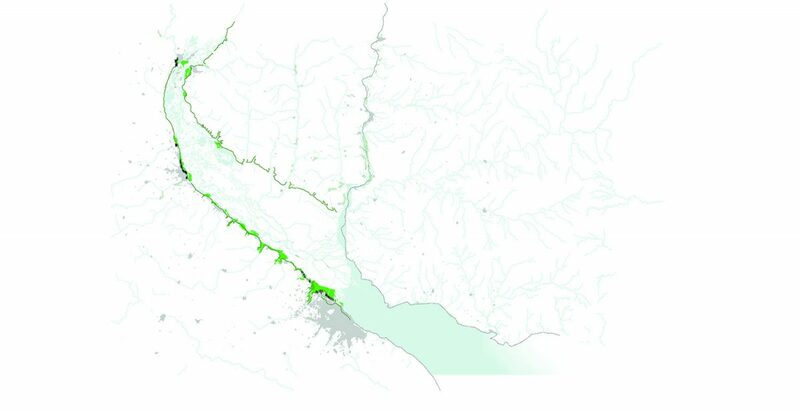 Green corridor- defining an urban edge to prevent urbanization from entering the fragile and flood-prone areas of the delta, while allowing passage and corridors into the delta for recreation.